Rasen skipper Joe Osbourne puts pressure on Skegness United's George Hobbins. Market Rasen Town fought back from behind to leave Skegness United with a 3-2 victory on Saturday. Lewis King netted a brace and Joe Osbourne was also on the scoresheet in a vital victory for the away side, which puts them three points clear of basement side Ruston Sports. They are now level with 10th-placed CGB Humbertherm on 11 points, but with a far inferior goal difference. United’s Wainfleet Road ground is never an easy place to get a result, as was proven the week earlier when league leaders Sleaford Town Reserves were held to a draw. However, a late fightback saw Rasen finish on top. Rasen began the brighter of the two sides, although the opening few minutes offered very little to write home about. All that changed in the 15th minute when King opened the scoring. Skegness failed to clear their lines following a corner and King placed his shot beyond the reach of home keeper Travis Portas. Dale Christie did enough to keep Harry Ginniff’s effort out as the hosts looked to regain parity. But the scores were all level after 38 minutes when Tom Pickett fired beyond Christie after George Hobbins’ initial free kick was blocked. Minutes after the re-start, Christie was called upon again to deny Ginniff’s header with an excellent save, pulling off another fine stop to deny Jake Portas. Portas got the better of the Rasen keeper in the 65th minute when the hosts were awarded a penalty after Hobbins’ run was ended by Matthew Rutherford. As the hosts turned the screw, Christie kept his side in the contest with yet more blocks. And his input was vital as the game turned on its head in the final 15 minutes. United’s Tom Pickett was shown a red card and a penalty was awarded to Rasen on the advice of the assistant referee, who said Pickett had punched a Rasen defender off the ball. Osbourne placed his shot well wide of Portas to level things up again. From this point United seem to lose their composure, and Rasen came more into the game, scoring the winner with eight minutes to go. Rasen were awarded a free kick on the right and, when the kick came in, King was at the far post to score his second of the match. Town will now look to climb the table further on Saturday when they host Skegness Town. 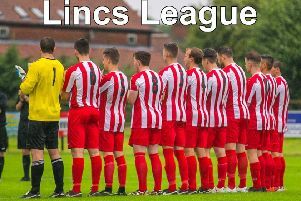 The Lilywhites are currently third in the table and looking to narrow the gap on leaders Sleaford following on from this weekend’s Supplementary Cup defeat against Lincoln Railway on penalties.